The BDF Commander-in-Chief Field Marshal Shaikh Khalifa bin Ahmed Al Khalifa met today with the CTF-150 commander Pakistani Naval Commodore Mukhtar Khan. 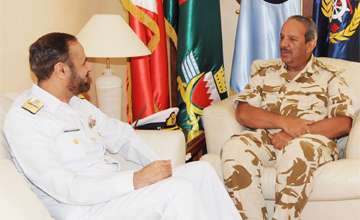 During the meeting, the BDF Commander-in-Chief welcomed the visiting Pakistani CTF 150 commander and reviewed with him existing bilateral friendly cooperation relations between the Kingdom of Bahrain and the friendly Islamic Republic of Pakistan and ways and means to boost these relations citing constant development of bilateral military liaison. The two sides also discussed various issues of mutual interest. The meeting was attended by the director of the BDF Headquarters Major-General Yusuf Ahmed Al-Jalahma. This entry was posted in News and tagged Bahrain, Bahrain C-n-C, Bahrain Navy, Bahrain news, Bahran, BDF, Pak, Pak Navy, Pakistan, Pakistan Navy, Pakistan news. Bookmark the permalink.